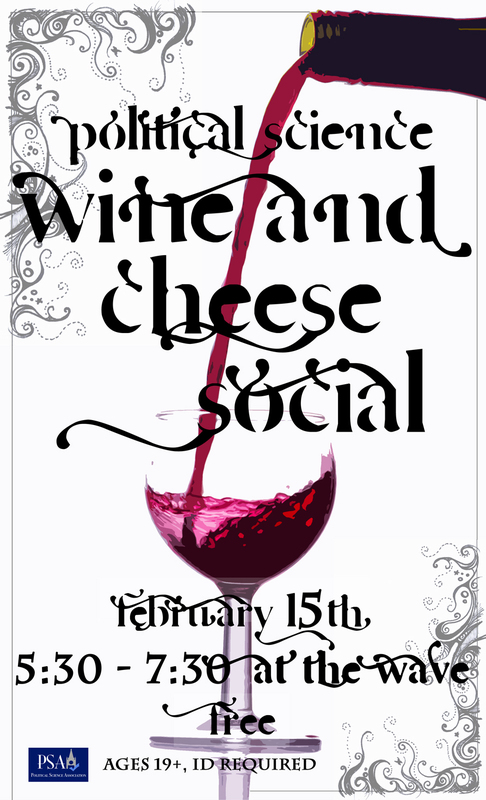 We are hosting a WINE & CHEESE Social at The Wave for all undergraduate students, graduate students, and faculty in Political Science on February 15th from 5:30-7:30 pm! The event is free. Complimentary appetizers, and refreshments will be served, including an assortment of fine wines and cheeses. Come out and socialize with your fellow Political Science students and professors! The event is ages 19+ and valid identification is required. EDIT (02/14/11): We are also excited to extend this invitation to all members who are under 19 years of age! The Wine and Cheese was previously advertised as a 19+ but we have just found out that people who are underage can also attend (but obviously not drink wine). If you do plan on drinking, make sure you bring valid identification with you tomorrow.